Immediately following our conference in Sinaia I was convinced to delay returning to site by a couple of days to visit the nearby city of Brașov. 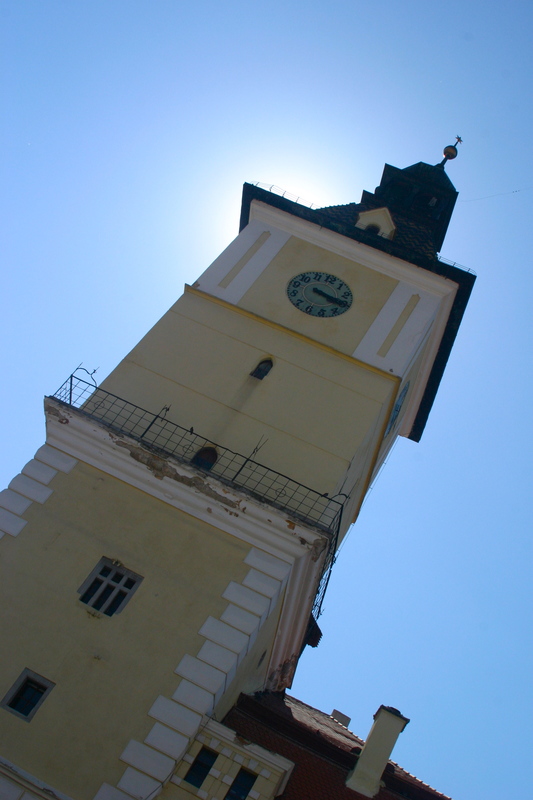 A few volunteers had wanted to make the most of their time in this part of the country and since it’s so close we figured ‘Why not?’ Brașov is only another hour and a half north from Sinaia by train and is the home to famed Bran Castle of Dracula lore. Though it is worth mentioning that Vlad Tepeș the Impaler, aka Dracula never actually lived in this castle; it is the site where Stoker borrowers inspiration for his book. So already packed for an extended stay, we went north instead of south for some added adventure in Dracula country. We arrived at the train station in Brașov on Saturday afternoon absolutely giddy. Not for Dracula or the beautiful historic city, but for Chinese food; and not just any Chinese food, but food court Chinese food. Again, as with the steakhouse in Sinaia, I feel that I have to mention why we were so excited at this prospect. Chinese food is not exactly widely available here in Romania. 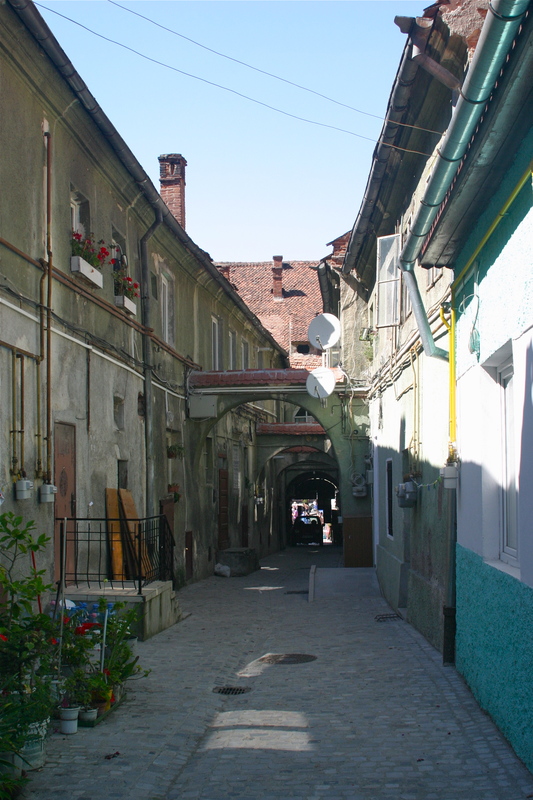 Bucharest certainly has it, but the little villages in which we were placed rarely have restaurants of any kind let alone something of any ethnicity, or further more…spice…of the heat or flavor variety. As a result, I am not embarrassed to say that I ordered the Farfurie Mare (Big Plate), which consisted of two main entrees and two side choices and probably the biggest plate of Chinese food I have ever had, never mind the copious amounts of MSG undoubtedly still in use here. Nor am I embarrassed to say that I did the same exact thing at the train station on the way out of town. This should be a big hint for any of my readers out there planning a care package, two words….Szechuan Sauce…okay maybe one more word….Sriracha. After satiating our craving for stir-fried goodness, we exited the little shopping mall next to the train station and made way for the cabstand. Now time for a quick side note directed specifically to my dear friends, Cab Drivers: Now there is certainly no way of mistaking the large group of us for anything but Americans; with our large packs, and louder voices we are a dead give away. But when we walk up to you speaking perfectly good Romanian and ask for a ride to downtown Brașov don’t try to egregiously rip us off. Yea, we know, you’ve pulled this off a million times with unsuspecting tourists, but we are Peace Corps Volunteers and we have your number. A few RON is no problem, we get it, and we are probably too lazy to fight you over it, but 50 RON instead of the normal 10 RON…please, that’s just insulting. Okay, back to my readers. 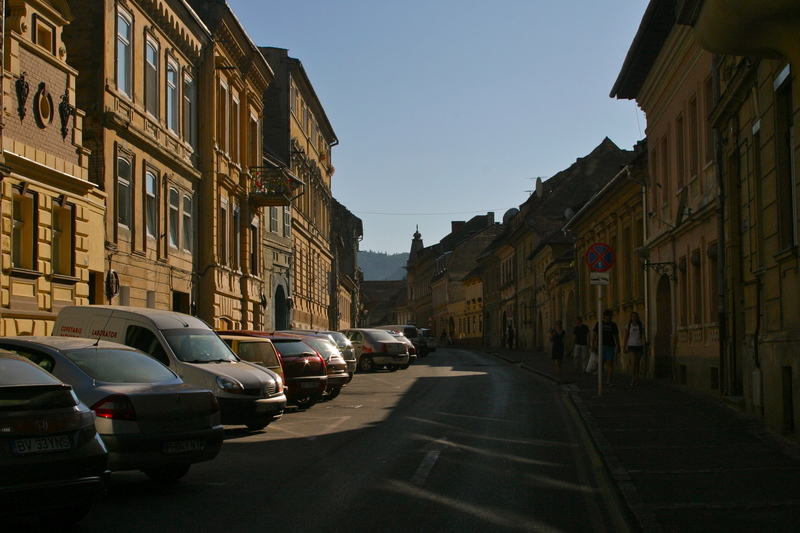 Once the twelve of us found three reasonably intelligent cabbies we split up for the ride into the historic center of Brașov and let me tell you dear readers, it is amazing. The old center is as beautiful as any plaza in Italy, complete with well-maintained buildings, impressive architecture, fountains, performers, vendors selling inexpensive homemade wine, cheese and honey, endless umbrellas shading patrons and their perfectly frosted beverages from the sun. Even the flock of pigeons seemed to have been specially trained in Western Europe, complete with French accents and brought here to fly perfectly formed circles around us and even seemingly thoughtful enough to aim their business elsewhere. Oh and the service…unlike it’s evil twin in Sinaia, the service here is impeccable without even an ounce of pretention. The waiters and waitresses are thoughtful, kind, energetic and even seem to be happy to serve us, as if we had been coming here for years. The following example should sum it up: For one reason or another we elected to stay at the Mare Hostel just off the plaza. Turns out that it is within the Hostelling International network and thus likely to be reputable. Though there is no write up about Mare Hostel in Lonely Planet we went with it anyway. The rooms were clean, generally well kept; the experience was just as it should be if not better. But here is the kicker; throughout my few days there I became the point person when it came to engaging the owner, Angie. When the group of 27ers started to arrive (their conference lasted a day later as they arrive a day later in Sinaia) we made arrangements to stay an extra night, but forgot to be at the hostel at the prescribed time to actually register and pay. Since I already had a large room for the group that I had stayed in the night before, we simply stored all of our stuff and hit the town. Angie called and without a bit of apprehension said “Don’t worry about it, you can just pay me tomorrow before you leave town.” As if this were not enough, when I actually did go to pay her the next day, I mentioned in passing how much we liked her hostel and that I would definitely be staying there in the future when friends came to visit. 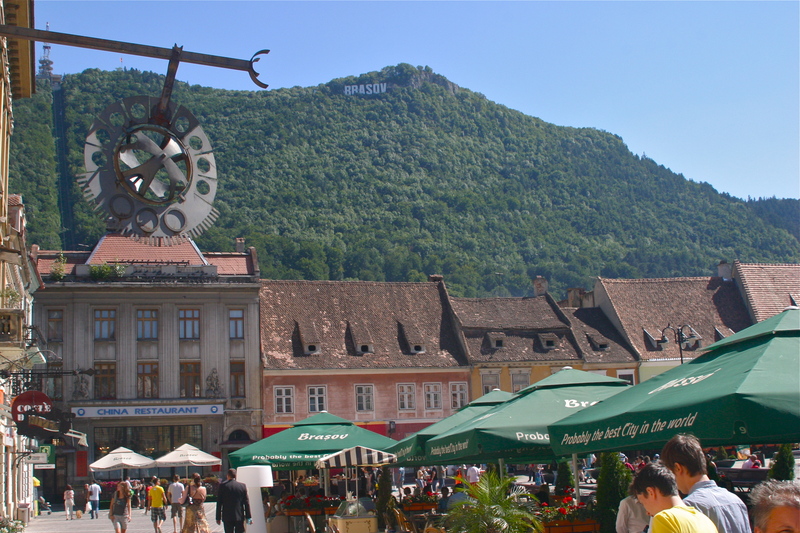 I also mentioned that Brașov was the one place that my Mother had specifically mentioned wanting to visit when she comes to Romania for vacation next year. Without hesitation, Angie said “Great, well be sure to call me before you arrive and I will help you plan your entire stay. Try to call a couple weeks ahead of time though so that I can make arrangements for you at an Inn or Bed and Breakfast though because your Mom probably won’t want to stay at a hostel.” Who does that? Talk about going above and beyond, exceeding the every expectation of your customer. Places in the United States could take lessons from this behavior, let alone Sinaia. If you come to visit me from the States I guarantee you a trip to this splendid city. Okay, so more about food, maybe I shouldn’t blog when I am hungry, but if you know me at all, then you know I like food. Not only does Brașov have Chinese food but also they have basically everything else you could want…well, I didn’t actually see sushi or thai, but I will forgive the city for the oversight. Every morning we were there began at the Come Again bakery where they basically have any kind of baked good you could imagine; from literally the best donuts I have ever had to flat bread pizza things that were inexpensive and amazing. The coffee thing here in Romania is a whole other blog post just waiting to happen but let me give you a quick introduction. First of all there are no industrial drip coffee pots with the stained glass bowl pitchers, one with a black top for regular and one with an orange top for decaf. Oh, no, my friends, every single cup of coffee is made to order from a magical machine behind the counter and every single cup is perfect. If you prefer table service, the coffee is just as good, but it is served on a small tray, with a coffee cup with an ergonomically designed handle, complete with saucer, strategically placed on top of a paper doily with exactly and always two sticks of sugar, none of this American rectangular packet stuff here. If you ordered your coffee cu lapte (with milk) you will also be served, to the left of the coffee as you face it, a tiny little narrow mouthed pitcher of fresh milk; no messy plastic creamer thingies here either. Interested in sweet n low, splenda, etc, better bring it from the States, only the real deal here. Free refills? Forget it, but once you have your first cup you will gladly pay the 5 RON (1.69 USD) a cup again and again. Not to be out done by their German baker neighbors, the Mexican food place is absolutely and ultra surprisingly incredible. 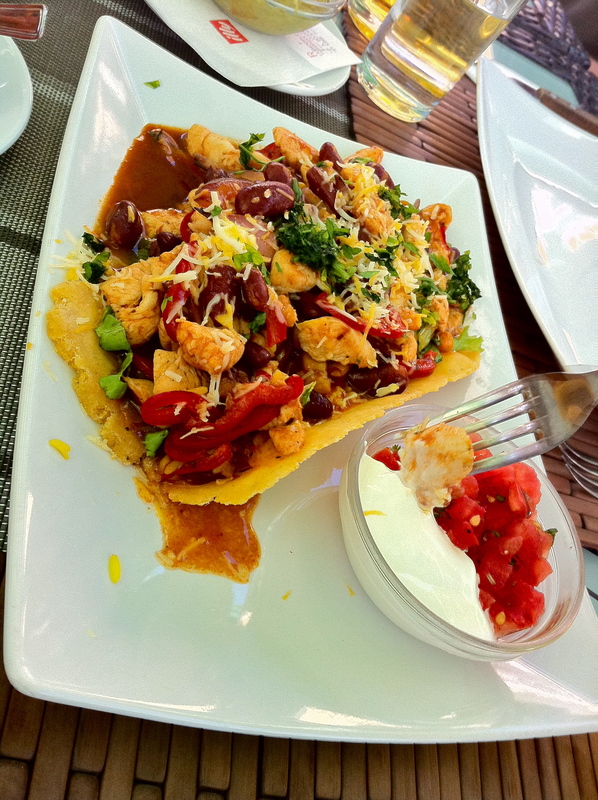 I know, I know, Mexican food in Romania, are you kidding me, how can you possibly be excited about that? I’m just saying, wait until you don’t have a Chipotle on every corner and see how you like it. 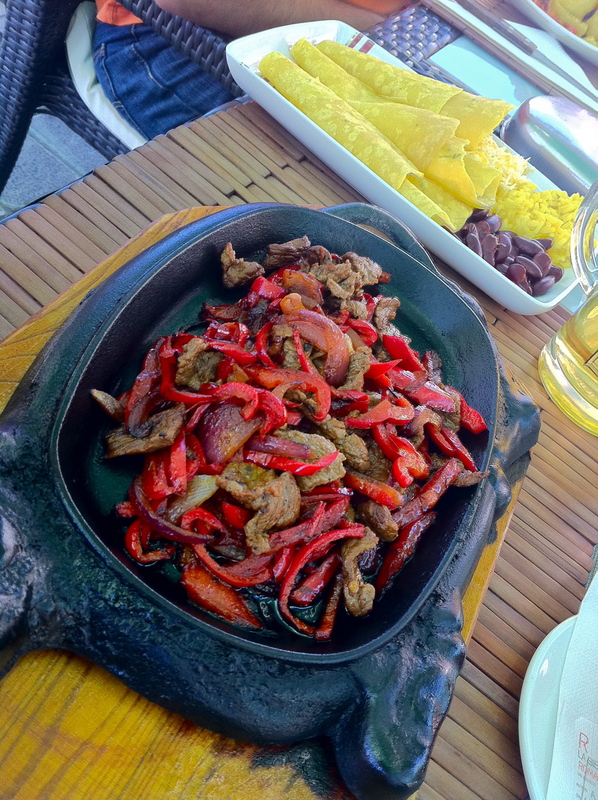 Let me remind you that Romanian’s don’t seem to like spicy foods, so it’s not surprising that Mexican restaurants would be few and far between. This place, however, is amazing. They make many of their menu items from scratch, including salsa, guacamole and flour tortillas; none of which are readily available in stores here in Romania and thus a real treat. As you can imagine, I wanted to order one of everything from the menu, with nothing but the prices and my small stipend stopping me. Thank god for likeminded friends; we went the next best route and ordered several things and shared all around. When the owner unexpectedly brought out complimentary servings of tequila, complete with salt and lime (also hard to come by), our day raised to a whole other, thought to be unachievable, level of happiness. How long could this utopia of good food luck hold out? Surely there is no way that the Irish Pub down the street could actually have real hamburgers and there is absolutely no way they would be any good. A good hamburger is hard enough to come by in the States let alone in Romania. At best I expected a solid hockey puck of blended meat (pork and beef, mostly pork) sandwiched between two half slices of soggy Wonder Bread. Never before have I been so wrong, though admittedly I have enjoyed better burgers, this one certainly held its own; juicy, properly cooked and on a buttered and toasted bun; heaven. What put this experience over the top was chili sauce. I know, not the usual condiment for a hamburger, but when I saw it on the menu as an option for French fries I couldn’t resist. The perfect balance of flavor and heat that soon encompassed my taste buds was almost too much to bear; I’m lucky that I didn’t burst out into tears over what was probably the best burger I will have in the next two years here. Pizza is fairly ubiquitous in Romania; it is also very often awful. Even though we are a stone’s throw away from Italy, the Romanians have adopted this syrupy ketchup-like substance for use as a pizza sauce topping; dulce (sweet) or picant (hot). The picant I can kind of understand, but why anyone would ever want sweet sauce on his or her pizza is almost unforgivable. Further more, if anyone offers you Smantana (Romanian Sour Cream) to put on your pizza I would encourage you to kindly but firmly decline. Luckily for me, most pizza joints in Romania have a Diavolo version, which usually consists of a thin crust, sos picant, cheese, some pepperoni-like substance, roasted red peppers and a sprinkling of hot jalapenos. Admittedly, I am a bit of a pizza snob so perhaps I am being to hard on the Romanians; come for a visit and you can be the judge. Regardless, we had a great meal at an Italian restaurant around the corner from the plaza with a very well executed pizza that certainly raised the bar. Okay, enough about food; onto some sight seeing. Aside from the plaza itself, there were a few tourist attractions that we couldn’t resist and a few more that we didn’t have time for. I’ll mention now that I didn’t bother with the Bran Castle visit, though other volunteers went, I figure in my time here there will be plenty of opportunities to see the famed landmark with State-side visitors. I did however, participate in a group trip up the super cliché telegondola to the Hollywoodesque Brașov sign. Once we reached the base of the gondola the ride itself was only about two minutes and was totally worth it. 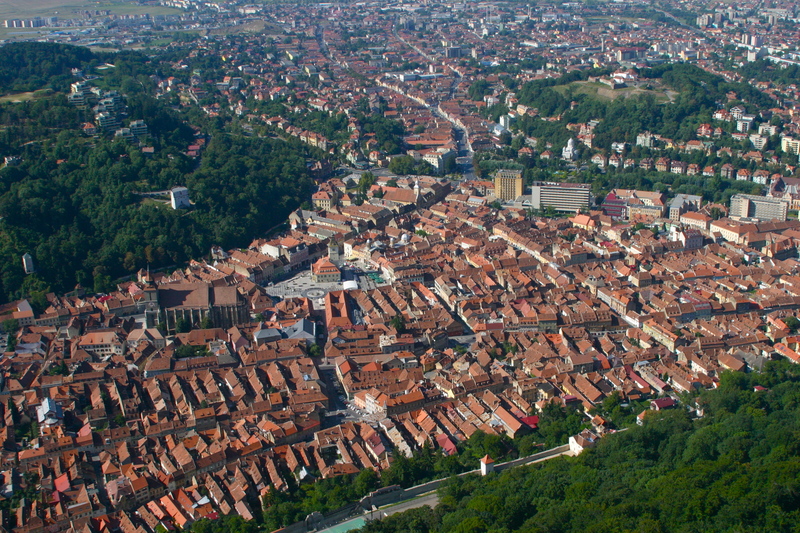 Brașov is beautiful up close, but from the top of the mountain is overwhelmingly incredible. We also visited the “Black Church,” named such as a result of a fire several centuries ago; though not particularly black anymore the church is quite majestic. We were fortunate enough to be there on one of the nights in which a short concert was being held to display the organ of 4,000 pipes. They only play the organ during the tourist season of July through August and then only three nights a week. Regardless, the church was packed for the hour-long concert, which hosted famous composers from Mozart to Beethoven and others I simply don’t remember. We also toured around town and found the “first Romanian school.” Whether this claim is true or not, we are certain that we found the site, but not so certain that we found the school. There is an old church on the grounds today, so perhaps the school was hosted inside the church. I know, horrible blogger, just google it and see for yourself. Well, that is about if for our trip to Brașov. There was actually a point when I was considering not making the trip, sighting the fact that I had already been on the road enough this summer, and just needed a weekend to decompress. Boy! I’m glad that I went; there is no better way to relax if you ask me. 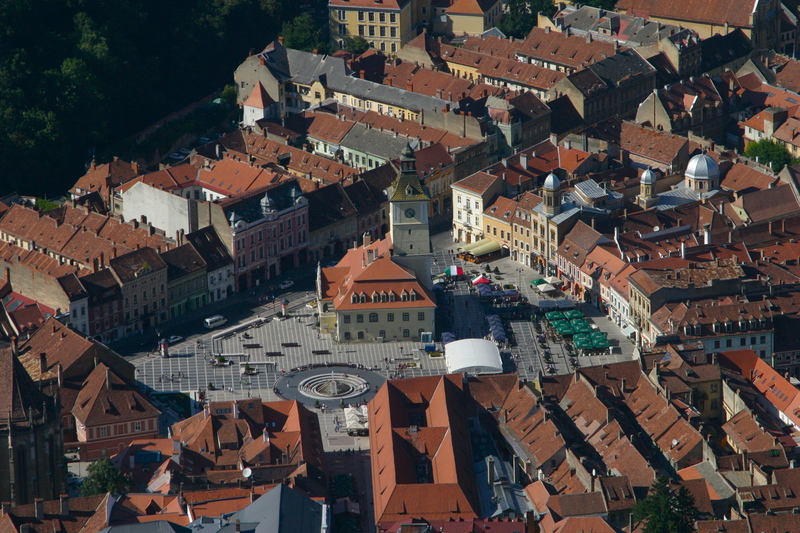 If anyone ever invites you to go to Brașov, be sure to take him or her up on the offer. Okay! You convinced me! I’m there… Can’t wait.